Step on the factory floor and witness the production of motorcycles from start to finish. One of only four American Harley-Davidson plants open to the public, the KC facility produces the Sportster, Dyna and V-Rod motorcycles, allowing visitors to observe operations such as laser-cutting, frame-bending and wheel assembly. Tours are free. Founded in Kansas City in 1989, Boulevard Brewing Co. has grown to become the largest specialty brewer in the Midwest. Featuring hoppy mainstays like Unfiltered Wheat and newcomers such as the Single-Wide I.P.A., it’s no wonder that the scene-stealer of the free factory tour happens to be the complimentary samples. Along the way, you’ll learn about the beermaker’s humble beginnings and witness its state-of-the-art brewing and bottling processes. 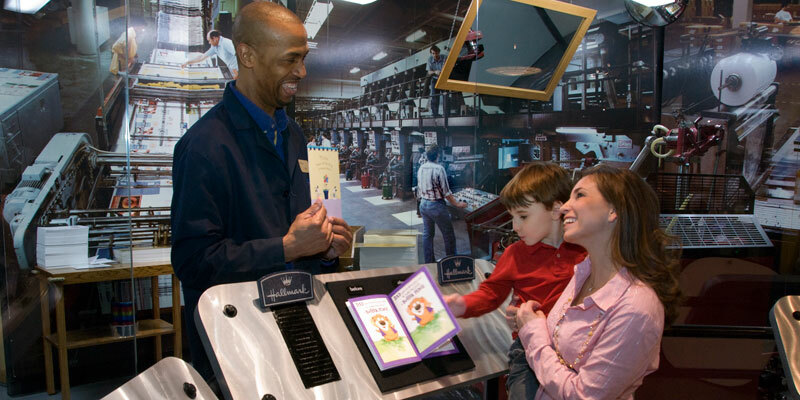 Located at the company’s headquarters in Crown Center, the Hallmark Visitors Center delves into the 100-year history of the world’s largest greeting card maker. Discover the wonders of Hallmark creativity during this free tour; interact with artisans, watch the printing of cards, create your own bow or even enjoy a virtual visit with popular Hallmark characters such as Maxine, hoops and yoyo. KC’s caffeine scene wouldn’t be the same without bean baron Danny O’Neil. In 1993, he started The Roasterie inside the basement of his Brookside home. The specialty coffeemaker has since become a local staple, serving more than a million customers each year. Learn about the origins of coffee, as well as the roasting, cupping and blending of the bean on a free tour of the company’s factory. For a great souvenir, pick up a pack of The Roasterie’s signature Kansas City Blend. Once the site of a potato-washing facility, the wonder emporium that is Moon Marble Company now houses timeless toys and every marble imaginable. From mibs and peewees to shooters and boulders, this place has it all. In addition to “knuckling down,” make time for the company’s free marble-making demonstrations to learn about marble history, the process of glass working and other fascinating marble facts. Kansas City’s richest, creamiest fudge and mouth-watering chocolates are made fresh by hand before your very eyes at Chip’s Chocolate Factory in Crown Center. Free demonstrations are given to the public throughout the day and include a free sample. Be sure to try the Kansas City Fudge—a velvety, handmade confection available in 30 different flavors. Shatto Milk Company, a family-owned operation about 60 miles north of Kansas City in Osborn, offers interactive farm tours year-round. In addition to sampling many of Shatto’s tasty dairy products, visitors can also learn how milk is bottled, milk a cow and pet baby calves (some lucky visitors may even get to bottle-feed one). Tours of the 400-acre farm are just $5 per person (free for children ages two and under).